We’re continuing our series highlighting academic-led journals. These journals are helping to pave the way for sustainable open access (OA) publishing by introducing alternatives to subscription titles and using tools and services to produce OA articles more affordably than most corporate publishers. In the last post we spoke with Timothy Gowers, who uses Scholastica software to run two mathematics journals that he founded— Discrete Analysis and Advances in Combinatorics. For this next post, we caught up with Jesper Sørensen, the Robert A. and Elizabeth R. Jeffe Professor and Professor of Organizational Behavior and Sociology at Stanford University. Sørensen is editor-in-chief of Sociological Science. In this interview, he discusses his experience launching the journal and why he believes now is the time for more institutions and scholars to embrace academy-owned publishing models. Since its inception, Sociological Sciences’ primary goals have been to make sociological discourse more timely and accessible. The editors recognized two challenges within the field— drawn-out peer review processes delaying the dissemination of novel research and paywalls preventing many from accessing the latest sociological discoveries. “In our view, too many debates in the field were hidden from view and were too slow to evolve,” explained Sørensen in an Open Access Stories interview. To address these problems, Sørensen and his team made Sociological Science a free-to-read Gold Open Access Journal and they developed a unique peer review model that enables them to make all publication decisions in 30 days or less. The journal has been able to achieve this impressive turnaround time by using its board of consulting and deputy editors as its main reviewer pool, only asking that external referees give a thumbs up or down to a paper without having to write lengthy review reports. The journal also does not employ revise and resubmit requests. Rather, the journal accepts papers that are both novel and accurate as is and provides conditional acceptance to papers that show promise but contain flaws, requiring authors to fix any inaccuracies before publication. In order to achieve a 30-day manuscript turnaround time, the editors of Sociological Science needed to have tools to easily manage peer review - from tracking new submissions to assigning manuscripts to editors and communicating with external reviewers. They chose to use Scholastica’s peer review software because it provided them with the centralized platform and tools they needed to set up their unique editorial workflow as efficiently as possible, enabling them to immediately focus their attention on soliciting quality submissions. Now in its fifth year of publication, Sociological Science is among some of the earliest online-only academic-led journals. From the time that he developed the idea for the journal, Sørensen said operating it via an academy-owned model was an obvious choice. Sociological Science is entirely scholar-run and published under its own non-profit organization, the Society for Sociological Science. The journal is funded via a combination of a small submission fee and a publication fee that ranges from $10-$300 per article, well-below the article processing charges of its OA corporate-run counterparts. The jouranl is showing that it’s possible to publish quality research at a fraction of the cost of traditional titles. By taking profit concerns out of OA publishing Sørensen believes that academy-owned journals are not only producing quality research more affordably but also safeguarding against journals being started or discontinued based on their revenue potential. This was the case for the now academic-led journal Internet Mathematics, which was discontinued by its former publisher Taylor & Francis for financial reasons. 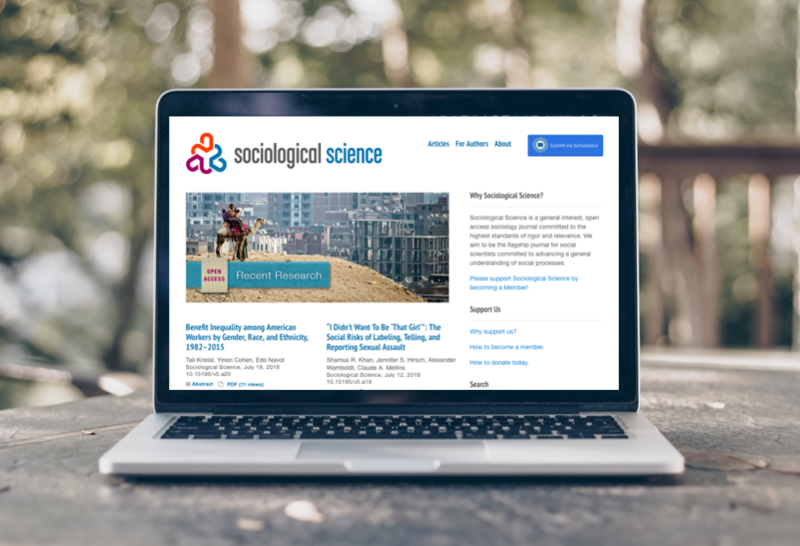 You can learn more about Sociological Science by visiting the journal’s website. Are you interested in launching or supporting an academy-owned journal? There are a number of great free resources and groups that you can reach out to including the Free Journal Network (FJN), a site aimed at promoting journals run according to the Fair Open Access Principles that offers support to new and existing academic-led journals, and the SPARC Declaring Independence resource page. You can also check out our free resources on running academic-led journal’s, including “Welcome to the age of academic-led journal publishing,” a public resource page, and The Essentials of Academic-Led Journal Publishing, a comprehensive guide to starting and supporting academy-owned journals. At Scholastica, we're building out our open access publishing platform to make it easier for journal publishers to reach their indexing goals. We're producing machine-readable XML files for all articles published using our platform and introducing automated article deposits for major indexes. What is academic-led publishing? Why does it matter? And what are examples of academic-led publishing initiatives? These were some of the core questions addressed during the first Academic-Led Publishing Day. In this post, we share some highlights from the day.